Online registration for the 2019 BOOST Conference is now closed. BOOST will accept additional registrations on-site at a rate of $605 each. We will see you in Palm Springs on April 30 - May 3! (Please note that registering with a Purchase Order will hold your place, but PAYMENT MUST BE MADE IN FULL by May 3, 2019 to secure the Standard Registration Rate. If payment is not received by May 3, 2019 at 10:00 AM, Late-Bird Registration fees will apply. On-site registration will be available for walk-in participants from April 30-May 3, 2019 in the lobby of the Palm Springs Convention Center. *NOTE: On-site registration is not available for the Pre-Conference Academies. You must be registered online prior to the Online Registration deadline in order to be able to attend the Pre-Conference Academy. Need approval? Download a template justification letter to share information about BOOST with your administrators and decision makers. We gladly accept credit cards (Discover, Visa, & MasterCard), checks, and purchase orders (Please note that purchase orders will hold your place but must be paid in full prior to the close of each registration phase. Payments not received by the close of a registration phase will reflect standard registration rates or on-site registration rates). Sorry, but we do not accept American Express or cash. Registering with a Purchase Order or Check will hold your place, but PAYMENT MUST BE MADE IN FULL by the close of each registration phase: Super Early-Bird payment deadline is July 31, 2018. Early-Bird payment deadline is November 30, 2018. Standard Registration payment deadline is April 30, 2019. Late-Bird and Standard Registration payment deadline is May 3, 2019 at 10:00 AM. If payment is not received in full by close of each registration deadline, the Standard or On-Site Registration rate will apply (respectively). Check or Purchase Order payment must be submitted using the registration confirmation you receive at checkout. BOOST Conference is unable to issue a separate invoice according to your organization's policies. Note: All balances over 30 days old will be charged a 1.5% finance charge each month. I agree that registering with a Purchase Order or Check will hold my place, but PAYMENT MUST BE MADE IN FULL by the June 30, 2011 to secure the Super Early Bird Registration rate. If payment is not received in full by June 30, 2011, the standard registration rate will apply. Check or Purchase Order payment must be submitted using the registration confirmation you receive at checkout. BOOST Conference is unable to issue a separate invoice according to your organization's policies. Note: All balances over 30 days old will be charged a 1.5% finance charge each month. 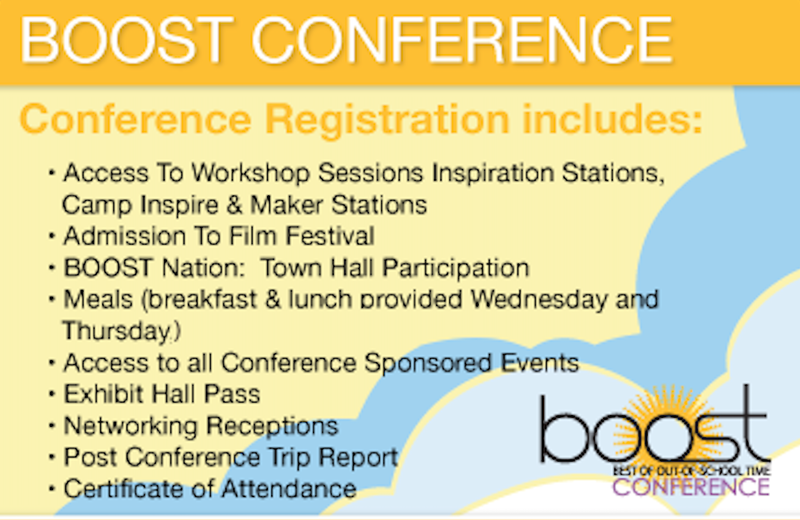 Questions about BOOST Conference registration?